Typhoon #18 on its path to the Japanese Alps, the blue dot in the centre of Japan. And if Patrick marvelling, astounded, at this fevered display hadn’t followed agape, hypnotised by the Jekyll and Hyde transformation he was witnessing in me, albeit a few steps further back than usual, then, if all of this, if all of this in its entirety hadn’t happened, a man would have frozen to death on Oku-hotaka that night. A man would have frozen as solid as the rocks on which he sat. That’s how they would’ve found him, hard as a rock, staring out blankly, lifelessly from under his beanie, through glassy eyes behind frosted over spectacles. Hunkered down in the tent, a tent, free-standing, weighed down with us and our gear and four bowling ball sized rocks from the mountainside jammed into each corner, on a path three foot wide edging a drop into space, swaddled in our sleeping bags and all our spare clothes, it was Patrick who noticed the light first. An hour or so after we’d been there. A light in the near ink black darkness that hit the tent broadside meaning, that like us, he’d come cross country and hit the trail too. 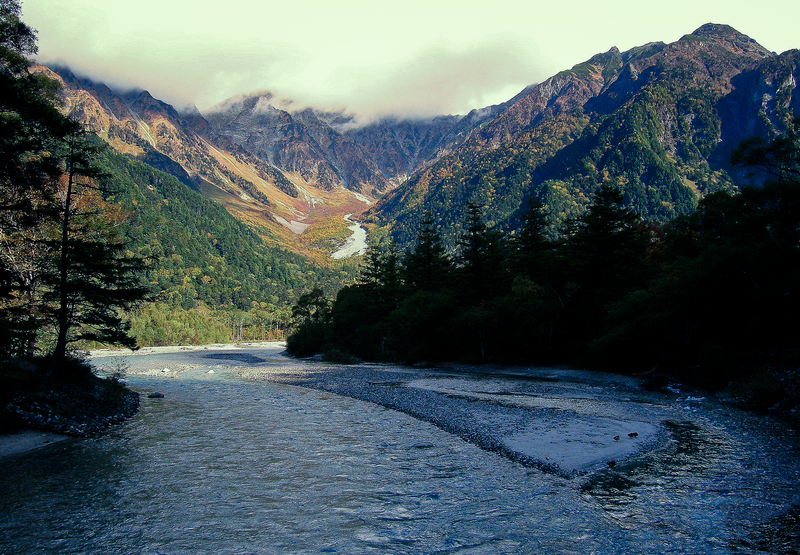 This entry was posted in Hyakumeizan, Mountains 91 - 100 and tagged adventure, hiking in japan, hotakadake, japan, japan alps, kamikochi, mountains, photography, Travel. Bookmark the permalink. Man, I have read this post 6 or 7 times. I have been over Oku-ho from the opposite direction on my own in the mist and almost lost the trail. I descended the Dake-sawa on shaky legs and nerves. Honestly, this and the sequel are beautiful pieces of writing. Thanks for the kind words, Dana. Those mountains aren’t ones to be taken lightly that’s for sure.